As I inch towards age 30, I continue to look for ways to improve my health. Recently, I thought a lot about my diet. Overall, it’s not terrible. I don’t drink much. I don’t eat out too much. I eat a lot of vegetables. I probably drink too many drinks from Starbucks. However–and this has been true my entire life–I don’t eat much fruit. I don’t know where my distaste for fruit comes from. I spent my childhood wandering through my grandparents’ garden, which had a field of raspberry bushes, rhubarb plants and grape vines. I’d pluck fruit from each and pop it in my mouth and go on my way. Perhaps I OD’d on fruit as a kid and now, I just don’t like it. On Sunday, I was at an event for my sorority called Founder’s Day. It’s the day in which we recognize Sigma Kappa’s founding on November 9, 1874. There, I met a woman who although she was 83-years-old, she looked like she was 60. Her body stood upright, her hair was beautiful, her skin fragile and she just epitomized health. I want to be like that. Adding fruit and other non-processed foods into my diet along with more strength training are two things I thought I could do to improve my health. One way I am going to add fruit into my diet is by drinking a smoothie every morning, Monday through Friday. Today, I share with you my first smoothie recipe. Place tea bag in boiling water. Let steep for three minutes. Mix in honey until it dissolves. 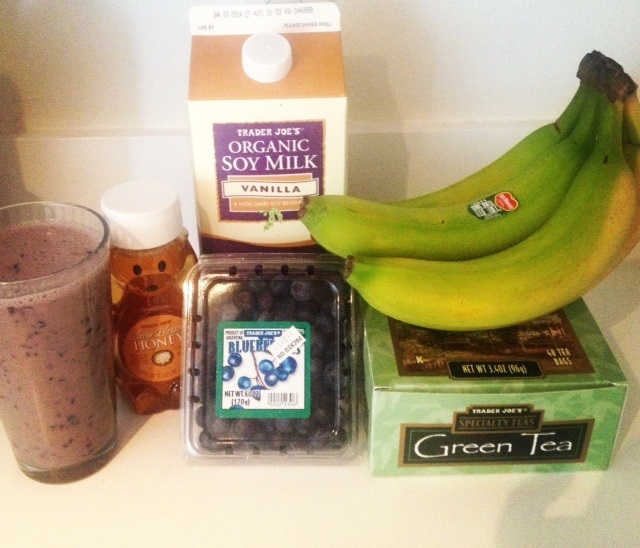 In a blender, add blueberries, banana, soy milk and ice. Pour tea mixture over top. Blend until smooth. ENJOY!